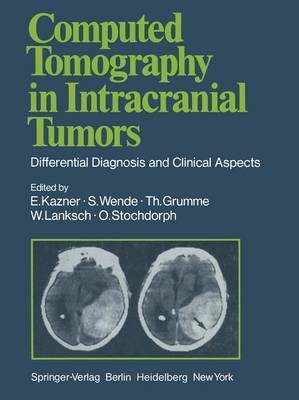 The current book represents a distillation of the experience gained in diagnosis of intracranial tumors with computed X-ray tomography at the University Hos- pitals of Berlin, Mainz, and Miinchen. To what purpose? Standard radiological techniques such as pneumoencephalography with lumbar puncture and cerebral arteriography with puncture of the common carotid artery are invasive proce- dures which entail a certain amount of risk as well as discomfort for the patient. Furthermore, diagnoses made with these procedures rely primarily on indirect signs of an intracranial space-occupying lesion - such as displacement of the air-filled ventricles or of normal cerebral vessels. Only a few types of tumor are demonstrated directly with these techniques. In contrast, computed tomography demonstrates the pathology directly in almost all cases, and this with a minimum of risk and discomfort. In addition, normal intracranial structures are demonstrated, so that the tumor's effect on its surroundings can be evaluated. Today, almost a decade after HOUNSFIELD'S revolutionary invention, diagno- sis of brain tumors without computed tomography is almost unthinkable, if not in fact irresponsible.